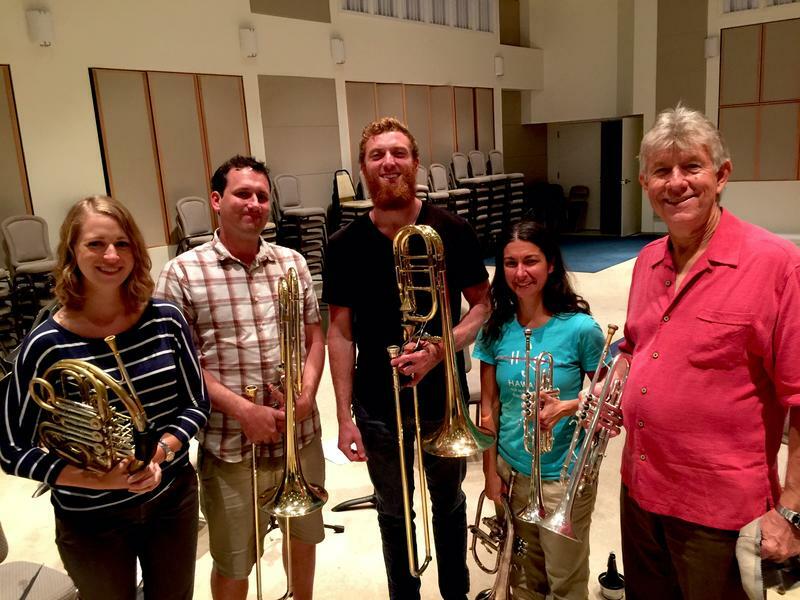 A trip to Kaua'i with Hawai'i Youth Symphony! Hawai‘i Youth Symphony concerts were held at Kaua'i Community College. plane for Kaua‘I. We were greeted by light rain in Līhu‘e, with clouds nestling along the ridges behind Kaua‘i Community College. Hawaii Youth Symphony has just completed a new strategic plan, one that builds on its first 50 years of student success. HYS Executive Director, Randy Wong, hopes to combine the openness of a community music school with the rigor of a first class conservatory. “Music is really the great social equalizer. Because it doesn’t matter where students come from, it doesn’t matter their economic background, doesn’t matter who their parents are or what grades they’re getting in school. Music gives kids of all backgrounds the opportunity to achieve. I don’t’ believe in talent. At all. Oftentimes when I hear people speak of talent it’s usually something like this. “Oh so-and-so is so talented,., they’re so talented they don’t need to practice.” And I think that does incredible disservice both to the person they’re speaking about and to the support system that has helped that person to become who they are. Anybody who has had any kind of success in anything, has had to work for it. We highly prize the work ethic. Any child can achieve through music. You just have to practice, and be ambitious, and work for it. Backstage at Kaua'i Community College Theatre, (l-r) Taiga Benito, Chris Yick, and Avery Farm unpack and begin to warm up. Backstage, behind KCC’s beautiful theatre, there’s already a lot going on. I ran into bassist Christopher Yick, who had just completed his Concerto Concert at ‘Iolani School the night before. He whipped out a short snippet from Kol Nidrei, testing out the bass he would be using on Kaua‘i. The bass players were pretty glad they could borrow instruments on island. 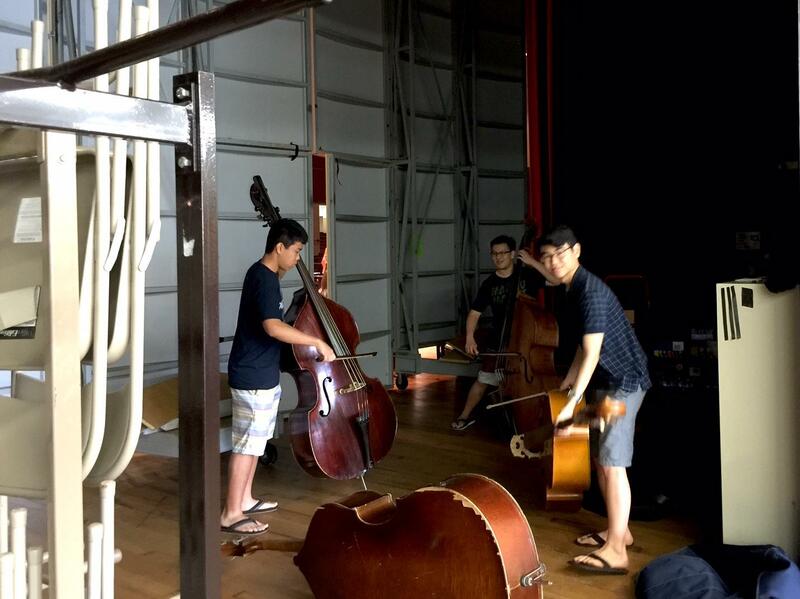 Boy, basses here, drums over there—xylophones, tympani, dozens of music stands---a lot of this was brought in by the advance team, with Jerry Kushiyama here, there’s also Gary Hirokane, Tom Shigeta, Delbert Nakaoka, David Yee, and Lloyd Nakamaejo. None of them have children in HYS now! Their kids are all graduated but the crew keeps coming back because they say, they like the organization. For the Kaua‘i tour, the crew transported and set up all the larger instruments that can be borrowed on island, and prepped backstage with chairs, tables, food, then they transferred all the students, backpacks, luggage and instruments. This crew, with Gavin Hirokane on O‘ahu, do all the set up for Hawai‘i Youth Symphony—4 orchestras, a summer institute, lotsa concerts. They’re Les’ crew. Les Murata has been helping out for decades. 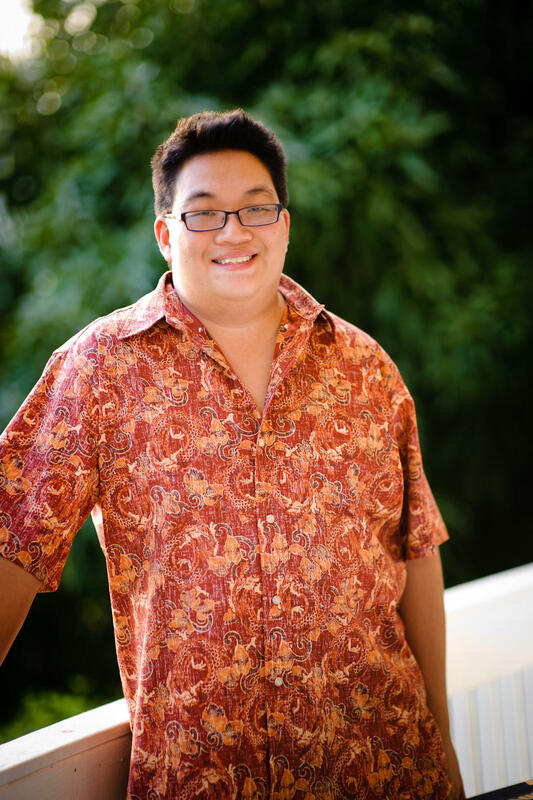 Everyone says he knows Hawai‘i Youth Symphony’s conductor, Henry Miyamura very well. That’s one of the skills that has gained Miyamura a rather fearsome reputation among young musicians. “Mr. Miyamura is very detail oriented,” says trombonist Julia Lee “I think that’s the whole thing with music, it’s all about perfection and practicing and always trying to get it right. It definitely is a higher level, but it’s more fun. It’s not as intense as I thought it would be, like scarey kind of thing. I was kinda nervous coming in, but it was definitely a good step up.” This is Julia’s first year in Youth Symphony I, HYS’s top orchestra. Onstage, Mr. Miyamura is pressing through a rehearsal for tonight’s program. They’ll be doing Thomas’ Mignon Overture, J. S. Bach’s Concerto for Two Violins, and Respighi’s Belkis. After intermission, they’ll power through Rachmaninoff, Puccini, John Williams and The Lord of the Dance. These are not abridged arrangements. I can see the musicians keying to Mr. Miyamura’s every expression. 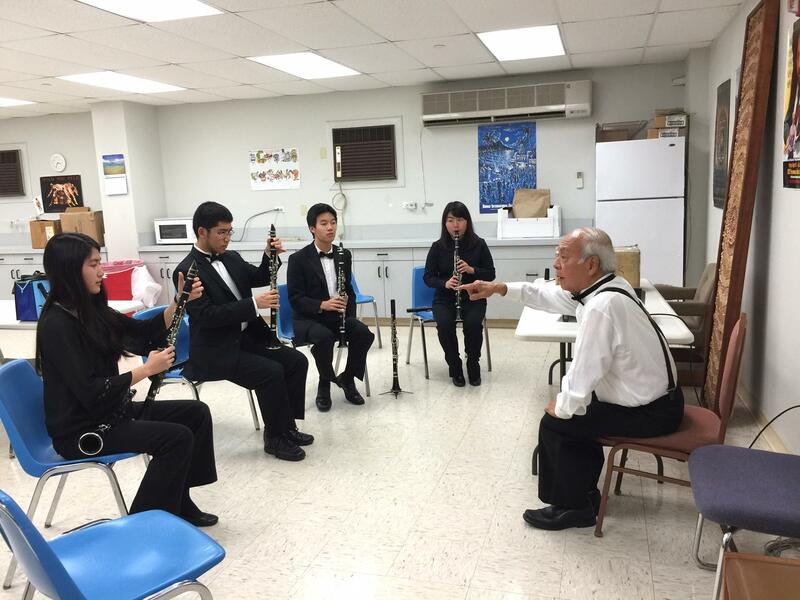 Mr. Miyamura is tuning the wind instruments. Since they come in parts, he’s basically telling them to shorten or lengthen the middle tube by minute fractions to alter the pitch…and other nuances. A selection of reeds Max Arakaki uses for his clarinets. Bassist Darryl Miyasato grew up on Kaua‘I, studied at the Manhattan School of Music, and played in the Spokane Symphony for five years before moving back to teach music at his alma mater, Kaua‘i High. Are people looking forward to this concert? Sarah Tochiki is band director at Chiefess Kamakahele Middle School in Līhu‘e. She says anyone who is interested can participate. She makes me wonder if in all our busyness there’s less music in our lives in Honolulu. People get so attached to their music experiences. What do you think accounts for the respect Henry Miyamura gets from these kids? What amazes me is the respect they have for each other. Prima donnas could not make it here! Which is good because Chelsea has decided to make her career in music. As people return to the stage, I ran across percussionist Shayn Toothman. The sounds of the metal and wood are so different! Every wooden slat has its own little metal amplifier below! Okay, you may never have seen this, it’s Ethan Murakami’s euphonium, or baritone. It’s got metal tubes of different sizes arcing around and ending with a flare. You tuck it under your arm to play. Ethan gave me a vivid explanation of how sounds are made through the euphonium, you have to hear it! Backstage parent volunteers are scurrying around, tuxedoes appear, black dresses, stockings, bow ties. Les Murata, HYS volunteer for 30 years, explains how it works. Tuition for a season in the top orchestra runs 575 dollars, heavily subsidized because the actual cost of services is estimated around twelve hundred dollars. Financial aid up to fifty percent is available for tuition, private lessons and instrument rental. Subsidies are available for neighbor island student travel. So says Kaua‘i resident, long time HYS board member, Dan Momohara. His kids commuted to HYS rehearsals on O‘ahu when they were members years ago. Backstage, Les is calm even though it’s ten minutes to four, ten minutes to start time and Miyamura is still tuning people somewhere back in a room. Oh there’s Joseph Fujinami, YSI’s concertmaster. 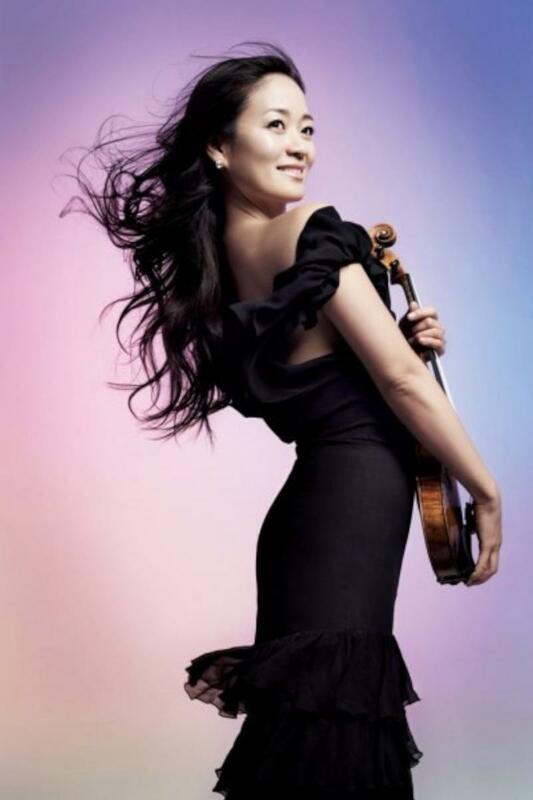 HYS was recently awarded a prestigious residency by world-renown violinist, Midori. She touched as many people as she could, and Joseph and other local students were allowed master classes. I asked Joseph if she could help him at all in twenty minutes? Joseph Fujinami and Midori at the Hawai'i Youth Symphony Concert. April 8, 2016. Despite his skill level, Joseph isn’t thinking about a music career, he plans to be an architect. As I listened to his solo in Puccini’s “O Mio Babbino Caro,” I thought, I’d like an architect with that sort of sensibility. Ninety seven chairs sit expectantly in the golden light onstage. One by one, tuba, trombones, trumpets, and horns file in. Clarinets, oboes and flutes join them. Violas, violins, cellos, and basses take their seats, adjust their music and begin to fine tune. The percussionists take their places. A journey into the world of feeling begins. 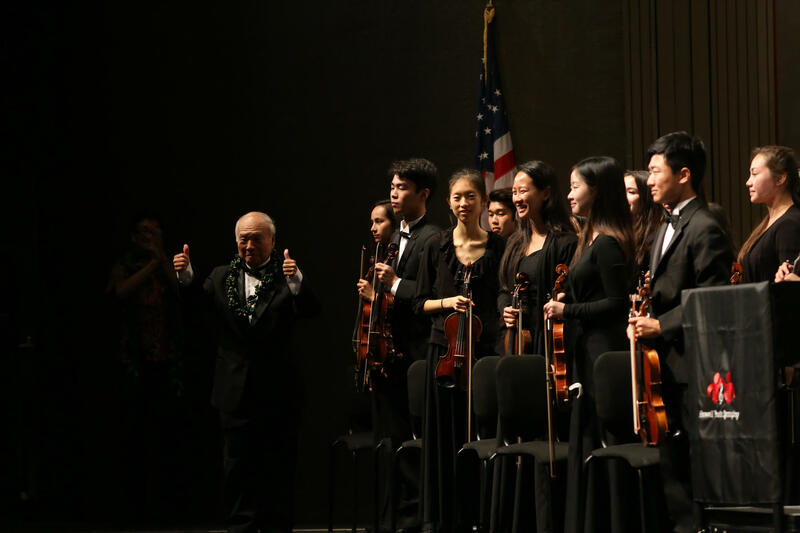 Maestro Henry Miyamura with members of Hawai'i Youth Symphony. Auditions for the Hawai‘i Youth Symphony’s top orchestras (YSI, YSII, and Concert Orchestra) 2016-2017 Season will be held the last two weekends in May 2016. HYS Summer Strings offers classes for beginning or intermediate violin, viola, cello or bass students. Students who are 8 years old by June 1 are eligible. Classes are weekdays from June 6 – July 8, 2016 at Boys and Girls Club Spalding Clubhouse on Waiola Street. 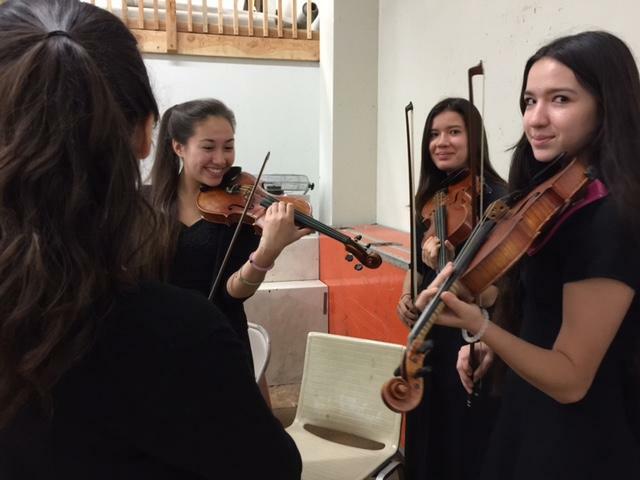 The HYS Pacific Music Institute happens every summer. 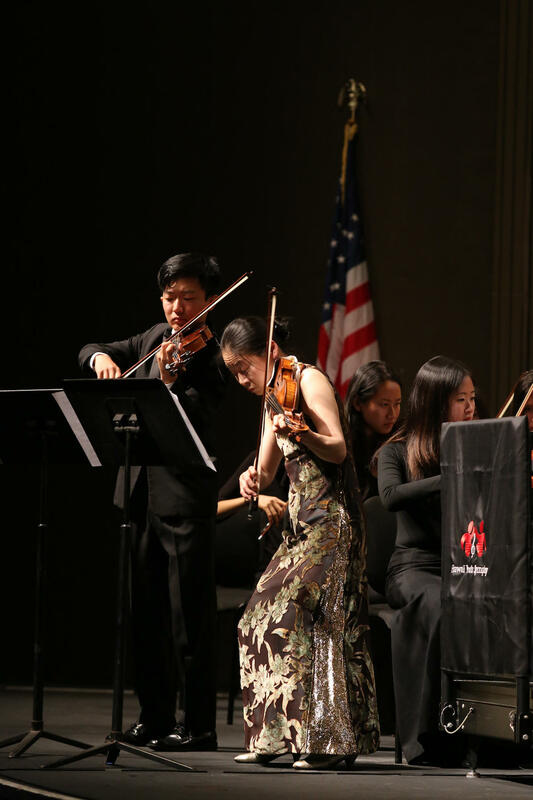 It’s an opportunity for students to participate in ensembles ranging from concert band and string orchestra to chamber music, jazz band, and symphony orchestra. Students entering grades 8 through 12 (including graduating seniors) with at least two years of instrumental experience are eligible to enroll. This institute is for serious music students. PMI holds classes at the UH Music Department, and concerts at Pearl City Cultural Center. Music lovers! The Kaua‘i All-Island Band made a splash at the 2005 Tournament of Roses Parade in Pasadena. Now the Band is on its way to Washington D.C. to perform in the 2016 National Memorial Day Parade and Concert Series. They will also perform at the Visitor’s Center in historic Gettysburg. Fundraising is underway now for this great musical experience. Find out more at the Kaua‘i All-Island Band website. If you're on the Big Island during the next few weeks, you have a chance to see some first class musical performances at the Hawaii Performing Arts Festival. HPR's Sherry Bracken is on Hawaii Island and tells us more. Adventuresome culture buffs have a new experience waiting as Hawai‘i Opera Theatre unveils its first production in Kaka‘ako. 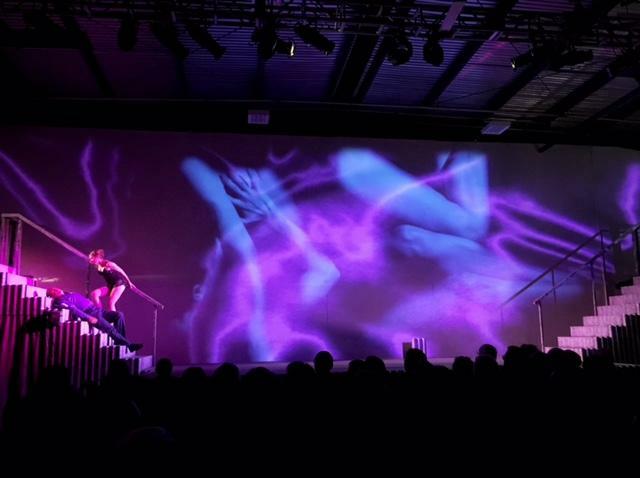 The warehouse space that houses Night Market and other events will be transformed to tell a particularly contemporary tale of deceit. HPR’s Noe Tanigawa reports. Hawai‘i Opera Theatre presents “Siren Song”, six performances only through March 29th. Street Grindz vendors will offer refreshments. It's a hot night in Baghdad, and the national theater is packed with people who are here to see the Iraqi National Symphony Orchestra. They're fanning themselves with programs that show conductor Karim Wasfi, a striking man with thick eyebrows and a pointed beard, playing the cello. 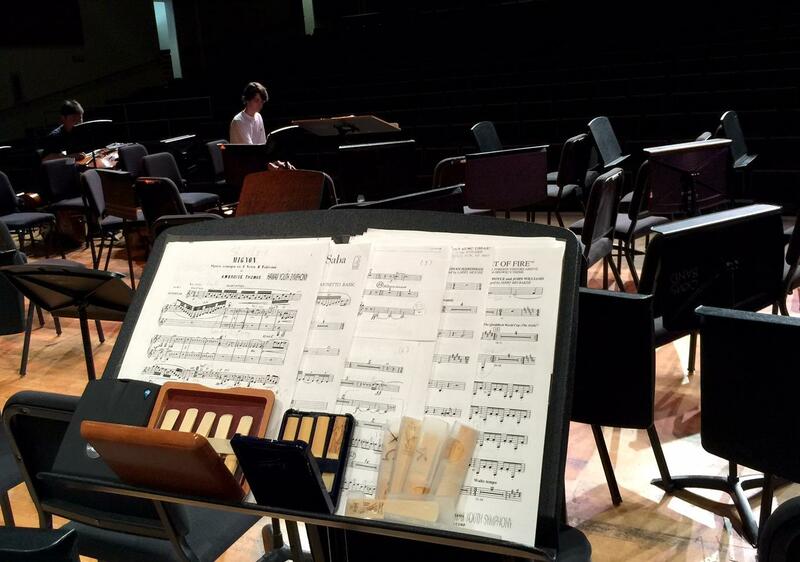 Tonight, he'll be conducting for the first time in more than a year. Iraq has been in the headlines lately, with extremists taking over parts of the country, American airstrikes, the militias and the politics. But the country was once a sophisticated center for learning and the arts.